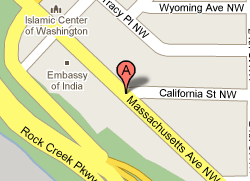 A suspicious package has closed Massachusetts Avenue between California Avenue NW and 24th St NW. MPD is responding now. DC Fire & EMS has tweeted the object is a backpack, but there’s “no associated threat”, which I take to mean there’s been no one calling in threats related to the backpack or the area. There’s also a second evacuation taking place at 901 7th Street: “susp package envelope @ 901 7th st NW some evac taking place” according to DC EMS. Ah suspicious packages, I really do loathe you. Update, 9:52a: Massachusetts Avenue has now been reopened after both packages were evaluated and neither deemed a threat. Thanks for covering this. I was wondering what was going on when I saw the 7th Street business this morning. Lots and lots of fire trucks, ambulances and police cars blocked off the intersection of 7th and I.